In this installment of TPF we take a peek at specific purpose tools meant for the AR-15 platform. Whether you have a old slab side Colt from the Vietnam era, or a brand new tricked out Armalite, these tools may interest you. Multitasker has made three different levels of tools specifically for the AR-15. The TUBE, Ultralight, and the company’s self named Multitasker, are their different levels of tools geared towards the field maintenance of the popular AR-15. At the 2010 SHOT Show, I was fortunate to talk to Mr. Shane Keng of Multitasker and talked to him about their AR platform specific tools and conduct a review of them. In today’s review we will be looking at the simplest product offered by Multitasker; The TUBE. A simplistic description of the TUBE is an aluminum pen-like chassis with two removable aluminum caps. The caps are threaded on utilize o-rings which prevents the caps from coming loose and getting moisture inside the tool. The upper cap with the retaining clip has a built in pin pusher for AR upper/lower take down. The spring steel retaining clip doubles as a small (3/16″) flat screwdriver. The lower cap is plain and has no additional features.. Breakdown of the chassis of the TUBE has two distinct areas. The upper part contains a magnetic 1/4″ driver socket which comes with a removable A2 sight adjustment tool (4 prong). The lower part incorporates a male threaded #8-32 mounting for the included carbon scraper and hook shaped steel pick, but also allows for a variety of cleaning attachments to be used such as those from OTIS. The TUBE can be carried like a pen in a pocket when assembled (scraper and pick contained in the lower cap), or in a Molle loop with the clip holding it securely. At under 2oz in mass, it is very lightweight. 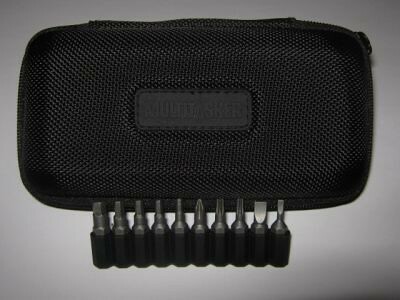 Offered as well is a small carrying case with internal pockets and a ten piece 1/4″ bit set. While without a loop or other fastening device, the expansion kit makes an already specific tool have far more potential applications. Made with a fairly sturdy nylon covered case and a heavy duty zipper for securing the case close, the expansion kit is rugged and built for abuse and every day carry wear. 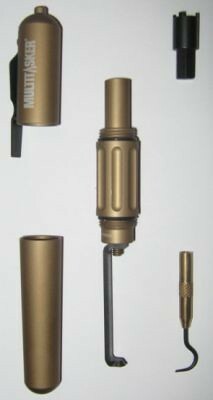 For those interested in Multitasker’s TUBE, you can order it from Brownells. Where the TUBE and it’s accessory package are listed for $39.95USD and $19.99USD respectively. Multitasker’s TUBE – Tactical, Practical, or Fantastical? P.S: Some images of how much can be stored in the accessory kit. 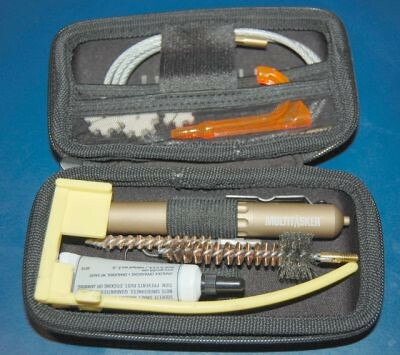 Included: Multitasker TUBE, expansion case w/bit pack, chamber flag, .223 chamber brush, 24″ wire Pull, 3 lock-up swabs, .22 bore brush , dry lube, and a bore reflector. This entry was posted on March 14, 2011 by M. Duynhoven. It was filed under Blades and tools and was tagged with multi-tool, Multitasker, TUBE.